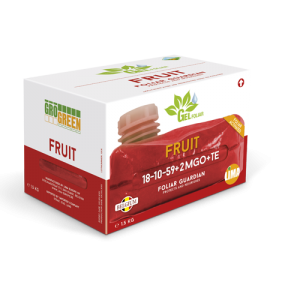 Grogreen Gel Fruit for foliar application is a high Potassium formulation that promotes ripening, enhances colour, increases sugar content, colour intensity, hardness of fruits and improves yield and crop quality. It is suitable for crops suffering from stress conditions such as draught, fungal attacks, poor soil conditions, etc. This NPK with Mg and micronutrients is suitable for crops that do not tolerate chlorides and it is particularly suited to provide nutrients required during early stages of development and fruit sizing. Gel form decreases the surface tension of the water drop that is formed when applied, increases retention of nutrients on leaves and favours stomatal opening for better and efficient absorption.